Whitehaven beach offers the best aerial views. If your idea of heaven is wriggling your toes in the blindingly white sand while turquoise water gently caresses the shore, then Whitehaven Beach is for you. This seven-kilometer long sweep of sand is on uninhabited Whitsunday Island, the largest of the Whitsundays 74 sublime tropical islands. Thought by many as the world’s best beach this pristine beach boasts intense white silica sand that is among the purest on the globe. At the northern end of the beach is Hill Inlet, a gorgeous inlet where the continually shifting tides create a beautiful fusion of colors where the sand meets the water. The Tongue Point lookout is the perfect spot to view Hill Inlet swirling sands. Best time to visit The best time to take a Whitehaven Beach day trip is during the Australian summer from September through to late December. The sand on Whitehaven beach has 98 per cent silica content. Whitehaven Beach is composed of nearly pure silica, 98 percent in fact, unlike most beaches around the world. The high silica content imbues the sand with its brilliant white gleam, which is almost iridescent in Queensland’s glorious sunshine. Thanks to that 98 percent silica content, the sand on Whitehaven Beach doesn’t retain heat. Hence, visitors can stroll along its gorgeous seven kilometers of sand comfortably even in the hottest of summer days. The island is strictly regulated and is part of the Whitsunday Island National Park. Smoking on the beach is prohibited and dogs are not allowed on the beach. Whitehaven Beach is an island in the Whitsunday Island group. The island is only accessible by boat, seaplane or helicopter. 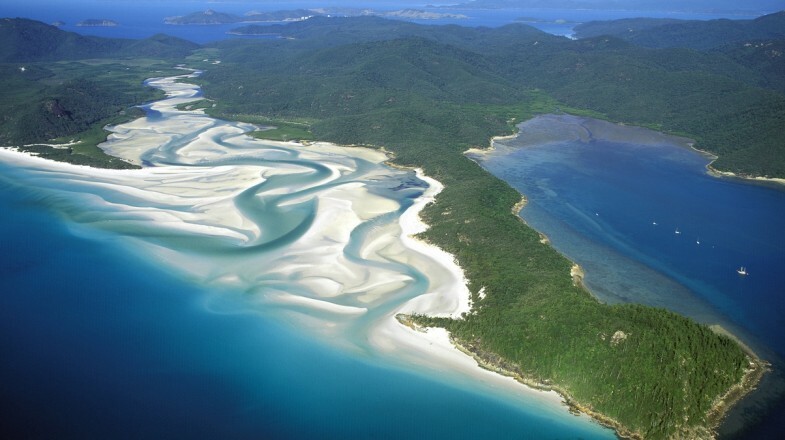 Whitehaven Beach tours depart from Hamilton Island and Airlie Beach in Queensland. From Hamilton Island, a high-speed catamaran service to Whitehaven Beach is just a 30-minute trip. One of the most hedonistic ways of reaching Whitehaven Beach is by sailing there on one of Hamilton Island’s stable of yachts. Alternatively, for a spectacular view of the island and surrounding Great Barrier Reef, book a flight on a seaplane or helicopter service to/from the island. Ferries, yachts, powerboats and luxury cruising yachts provide Whitehaven Beach trips departing from Airlie Beach in Queensland. There are catamaran services available that take you to Whitehaven beach. Laze in the warm Queensland sunshine, relax and de-stress while working on your tan. If you have a boat, check out the many deserted beaches and coves around Whitsunday Island. Take a dip in paradise and go for a swim or slap on a mask and snorkel from Whitehaven Beach’s azure water. Diving in the Whitsunday Islands is spectacular thanks to the Great Barrier Reef’s biodiversity. Expect to see colorful coral gardens, peripatetic green sea turtles, Napoleon wrasse and ever-watchful white tip reef sharks. Options include day trips from Hamilton Island, Airlie Beach and McKay and live-aboard dive boats. Keep your eyes out for local turtles, dolphins, and reef fish. 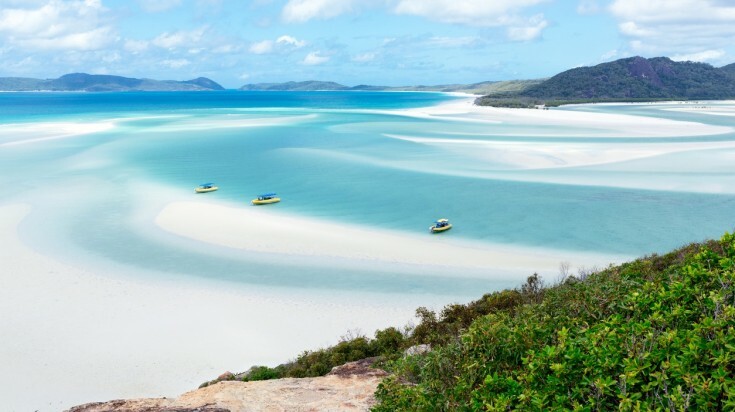 This 10-day tour includes a stop over at Whitsunday Island to visit Whitehaven beach with a chance to go snorkeling. 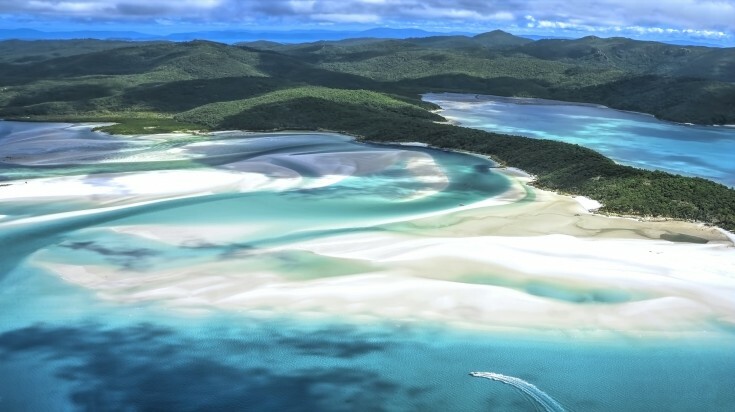 Take in a panoramic view of Whitehaven Beach and the surround Coral Sea. A short hike takes you up to Tongue Point. Time your visit for low tide, when you’ll see an amazing fusion of colors created by the turquoise sea meeting the Hill Inlet below. Have your boat skipper cruise around to Hill Inlet. This simply divine inlet is where each day the shifting tide swirls the sand and the sea creating a glorious eddying mix of colors. Combine your Whitehaven Beach visit with a hedonistic cruise around the glorious Whitsunday Islands. The Whitsunday Islands are recognized as one the great cruising destinations in the world. Hire a yacht, catamaran or motor cruiser or join a leisurely cruise with operators departing from Hamilton Island, Airlie Beach and Shute Harbour. Hop on a helicopter or a sea plane and witness the spectacular scenes from above. Don’t forget to bring your camera and capture the amazing tide swirls of the beach. Watch as the shifting of the tides create a unique mosaic in the sea. Aerial tours also provide a chance to view the Great Barrier Reef from above. A sea kayak is a perfect way to get up close to tropical fish, coral, turtles and manta rays, without risking getting wet! Many local companies offer sea kayak and paddleboard hires. If you are into fitness, try unique fitness challenges in the beach. Each year in June, Whitehaven Beach plays host to the idyllic Great Whitehaven Beach Run. For those who are more into water sports, join in The Whitehaven Beach Ocean Swim to test your swimming endurance. This event is held annually each November. Whitehaven Beach faces east so some boat trips can be very choppy depending on local sea and wind conditions. Many boats stop at Tongue Point for the walk up to the lookout. There are dozens of tiny coves where you can get away from the day-trippers if you have boat access. 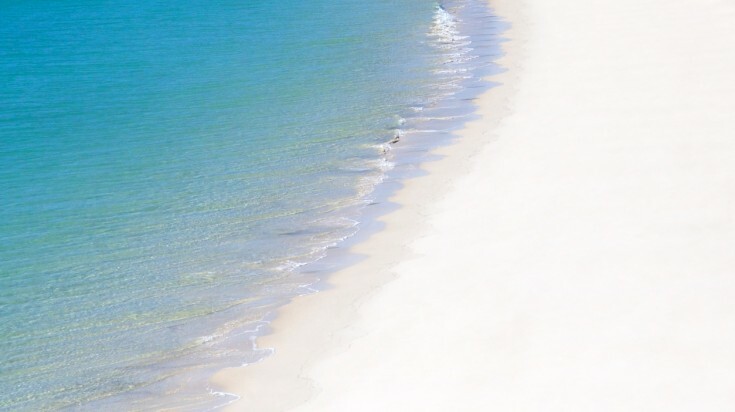 Whitehaven Beach is usually deserted before 10:00 am so the best time to arrive by boat is early in the morning and most boat trips depart at 4:00 pm so late arrivals often have the beach to themselves. There is no running water or food outlets on the island so bring plenty of both from your boat or aerial service. There are seven camping sites holding 36 people behind the north end of the beach. The group camping area has a pit toilet. Access is by boat only. Few visitors to Whitehaven Beach will quibble about its status as one of the world’s most beautiful beaches. Once you’ve visited, you’ll understand why people flock to Whitehaven Beach from all around the world. Flanked by lush tropical vegetation and a dazzling turquoise sea, Whitehaven Beach is the perfect spot to relax, chill and soak up the tropical vibe!